Over the past few weeks many people have come in complaining of middle ear infections. The combination of swimming and long plane rides during the summer months, as well as slightly less healthy eating habits have really had an impact on the vulnerable middle ears, especially those of children. My hands start itching when I hear this, as I know that there is a simple but important mechanism at play here; something that a specific chiropractic adjustment can have a major impact on. We all have a little tube that drains fluid from our middle ear (behind our ear drum) into the back of our throat. This tube is called the Eustachian tube and is kept open by two very small muscles (the Tensor and Levator Veli Palatini) muscles. These two muscles receive their information from nerves that exit the first two vertebrae of our neck. In short, when the joints of these vertebrae are blocked, the end result will be that the Eustachian Tube has less muscle tone and collapse on itself. This, combined with an increased mucous production (due to a cold, allergy or spending a lot of time in the water) creates the ideal breeding ground for a middle ear infection, also called Otitis Media. 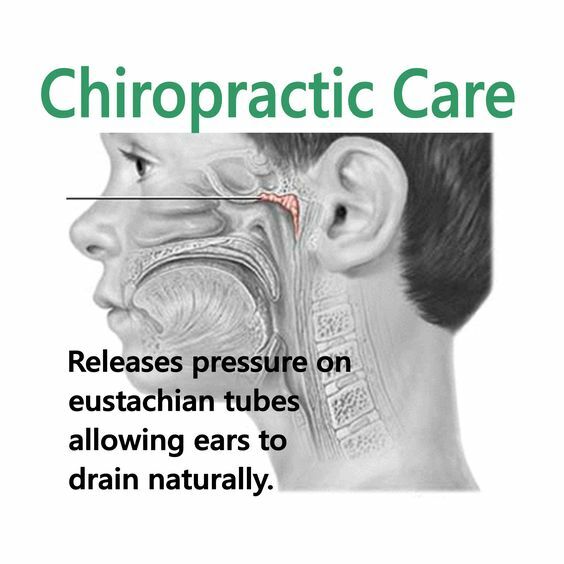 The reason that children are more susceptible to this is because their Eustachian Tubes are more horizontally orientated, which makes it more difficult to drain. Their immune systems are also still busy developing and strengthening. In general practice, to prevent the infection spreading to other orifices in the skull, or allowing it to burst your eardrum, a series of antibiotics are usually prescribed. A major concern with the use of antibiotics is that it will also kill the good the gut bacteria, leading to other problems like leaky gut syndrome and ironically, decreased long term immunity. Worldwide, the threat of antibiotic resistant diseases is also becoming more prevalent. Fortunately, there is a natural, more ‘body-friendly’ way to get relieve and prevent Middle Ear Infections. By using gentle and specific adjustments with our hands (some chiropractors might use an instrument), we are able to restore motion and function to the top vertebrae of the spine which will lead to improved function of those upper nerves supplying the muscles that open the Eustachian Tube. Most chiropractors will also assess the function of the jaw and cranium, as these have an impact on the middle ear function and drainage. 2. Avoid Mucous Producing Foods. Dairy products, bananas and red wine will increase the production of phlegm and mucous in your body which will cause more fluid to build up behind your eardrum. It only makes sense that you would want to give the body all the tools needed to heal itself. These include ensuring that you have enough sleep; drink plenty of filtered water and avoid sugary foods, as these tactics will support your body’s natural immune capabilities. You can also consider taking oregano oil and garlic as a natural, “bug -killing,” alternative!